Eureka! Heureka! An Astonishing New Ant! Most scientific discoveries these days emerge through carefully planned and controlled research programs. Every now and again, though, something unexpected just pops up in a distant tropical jungle. Martialis heureka is a fantastic discovery of that old-fashioned kind. This little ant simply walked up to myrmecologist Christian Rabeling in the Brazilian Amazon. 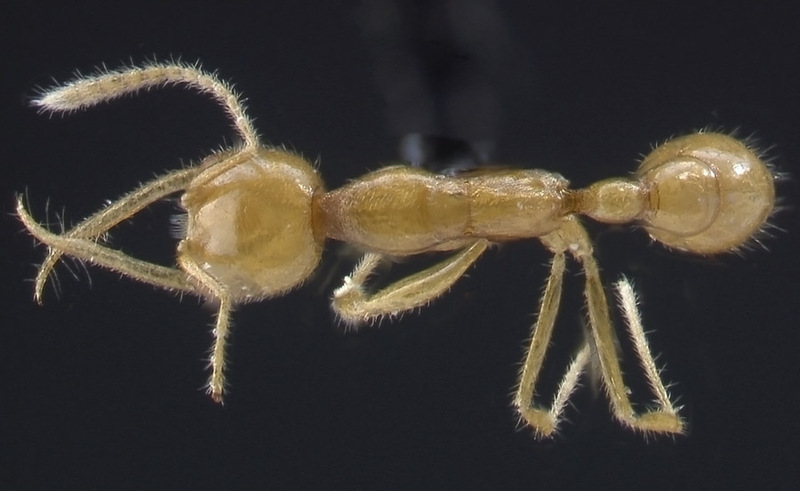 It is not only a new species, but an entirely different sort of ant than anything known before. The remarkable find was announced today in a paper by Rabeling, Manfred Verhaagh (who, a decade ago, collected and subsequently lost the elusive Martialis before he had a chance to properly examine it), and Jeremy Brown in the early edition of PNAS. If the DNA evidence is correct, Martialis is as ancient and as odd as an ant can be and still be called an ant. The lineage emerged right at the dawn of the family and provides a new line of sight back to the elusive ant ancestors. We can say that Martialis really is an ant and not just another wayward wingless wasp. The insect bears all the telltale traits marking the ant family: a metapleural gland on the thorax, a constricted waist segment, and an elongate first antennal segment. In Rabeling et al’s analysis, DNA sequence from three nuclear genes (18S, 28S, and EF-1alpha) places Martialis outside the rest of the living ants, but only slightly. At left I have drawn up a simplified phylogeny, an amalgamation of Rabeling et al’s finding and the landmark 2006 studies of Brady et al and Moreau et al. Martialis is blind and pale, traits normally associated with subterranean species. It was collected in rainforest leaf litter, at dusk, near Manaus, Brazil. The elongate mandibles imply a predatory specialization, although on what we do not know. Rabeling et al suggest “annelids, termites, insect larvae, and other soft-bodied arthropods”. The ant has a stinger, as do all the early lineages. The presence of a metaplueral gland- thought to be associated with ant social behavior- indicates that Martialis lives in colonies. Dr. Wilson…is trying to contain his excitement: the 14,001st ant species has just been discovered in the soils of a Brazilian forest. He steamrolls any incipient skepticism about the ant’s uniqueness — the new species is a living coelacanth of ants, a primitive throwback to the first ant, a wasp that shed its wings and assigned all its descendants to live in earth, not their ancestral air. The new ant is so alien, Dr. Wilson explains, so unlike any known to earthlings, that it will be named as if it came from another planet. With due respect to Wilson, such a view is a mistake. Martialis has over 120 million years’ separation since the ur-ant, plenty of time to develop along its own trajectory. The surviving species is not a throwback but a mix of primitive traits retained from the ancestor and unique traits acquired in the elapsed time. The same is true of most other living ants. Those impossibly long jaws, for example, are not present in any of the other early lineages nor in any of the fossils, almost certainly arising in the intervening millenia as Martialis developed a predatory specialization. And even though both Martialis and the next earliest lineage, the Leptanillines, are blind and pale, such traits evolve so readily among other ant groups (see here, here, and here) it is difficult to infer confidently that the ur-ant was also a yellow eyeless wonder. Rather, Martialis is important because we have a new window backward from which to view the ur-ant. 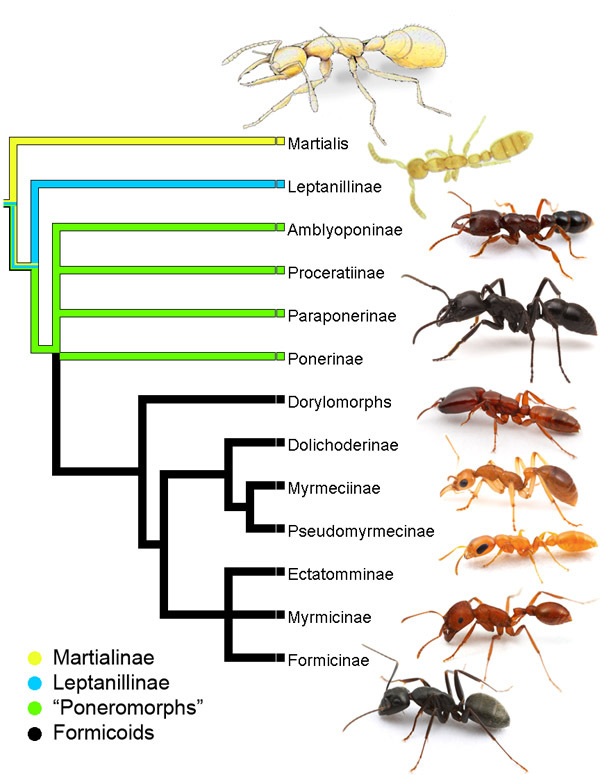 This perspective, when combined with knowledge of the other early lineages (Poneromorphs and Leptanillines), will provide a stronger triangulation on the nature of the first ants. We will be able to infer with greater confidence the sequence of evolutionary events early in ant history. It gives new data where the existing knowledge was fuzzy. As an example, the most troublesome aspect of current ant phylogenies is uncertainty surrounding the very earliest events in ant evolution. 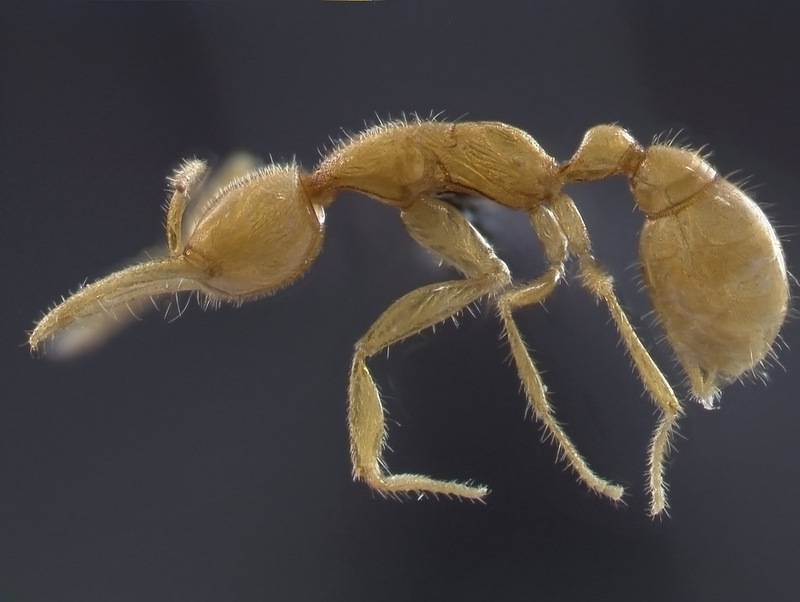 The genetic studies of Moreau (2006) and Brady et al (2006) unexpectedly fingered the subterranean Leptanilline ants as sister to all other species. Further exploration by Brady et al (2006) indicated that the Leptanilline arrangement might be an artifact of the data, leaving myrmecologists feeling a bit like we were back where we started. In Rabeling et al’s work, Martialis falls in exactly the right place to clear up the confusion: the ancient age of Leptanillines is likely real, not an artifact. And Martialis is older still. Where we go from here will depend on whether someone succeeds in finding living Martialis. The missing link now is not the ant itself but the knowledge about what it does. Original Paper: Rabeling, C., Brown, J. M., and Verhaagh, M. 2008. Newly discovered sister lineage sheds light on early ant evolution. Proceedings of the National Academy of Sciences. doi: 10.1073/pnas.0806187105. Brady SG, Fisher BL, Schultz TR, Ward PS (2006) Evaluating alternative hypotheses for the early evolution and diversification of ants. Proc Natl Acad Sci USA 103:18172–18177. Moreau CS, Bell CD, Vila R, Archibald SB, Pierce NE (2006) Phylogeny of the ants: Diversification in the age of angiosperms. Science 312:101–104. I am struck by another apparently derived condition of this critter — the robust muscularity of the fore legs, compared to those spindly middle and hind legs. I wonder if they somehow grip prey with them. Can’t wait to read the full article, and I hope this doesn’t end up being another Nothomyrmecia, that keeps us waiting for decades to rediscover it and find out more about it! Way cool! For your 3 nuclear genes you have 18S, 18S, and EF1alpha. Is one of those 18S’s a 28S? Do these primitive ants form complex societies and castes like the more well-known ant types? Wow, I was bound to make some sort of typo. Yes, one of those is 28S. The thing is, we really don’t know about the social behavior of Martialis. The single specimen has the markings of a worker caste- implying the existence of a separate reproductive caste, and the presence of a metapleural gland may also indicate communal living, but we don’t really know. Someone needs to find them alive. I am pretty confident that Christian will present an entire living colony very soon. He has a talent for finding “cool ants”. I would be great to learn something about the biology of this fascinating ant. Now how do we kill it? I am the mother of a 9 year old who is interested in doing a little report about this Martialis heureka ant for her 4th-grade current events science project this month. We’ve printed off some articles but most are targeted to adults. Can you either explain some of the findings about this ant in layman’s terms or point us to a possible link/reference that might be able to? Or perhaps there is a broader topic about biodiversity of the rainforest that she might research and mention this ant as a side note. Any ideas? Thanks so much for your help, if you have time. P.S. interestingly enough, I was a biology major many years ago and never even pushed her in this direction. I suggested she do her report on plastics or the brain chemicals of teens & how they cause embarrassment. She insisted on this ant instead! Guess it’s in the “genes” afterall, even though I am no longer practicing in the field. Great find, and yet again proof that there are many thousands of animals, insects still to be discovered. Many thanks for a very interesting article. Hi, First time poster and glad to be a part of the conversation.